Copyright © 2013, Australian Computer Society, Inc. 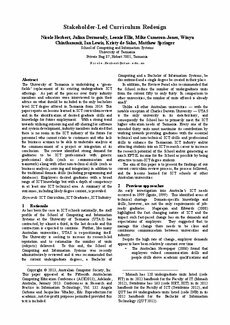 This paper appeared at the Fifteenth Australasian Computing Education Conference (ACE2013), Adelaide, Australia, January 2013. Conferences in Research and Practice in Information Technology, Vol. 132. Angela Carbone and Jacqueline Whalley, Eds. Reproduction for academic, not-for-profit purposes permitted provided this text is included. The University of Tasmania is undertaking a ‘green- fields’ replacement of its existing undergraduate ICT offerings. As part of the process over thirty industry members and educators were interviewed to gain their advice on what should be included in the only bachelors level ICT degree offered in Tasmania from 2014. This paper reports on lessons learned in ICT curriculum review and in the identification of desired graduate skills and knowledge for future employment. With a strong trend towards utilising outsourcing and off-shoring for software and system development, industry members indicated that there is no room in the ICT industry of the future for personnel who cannot relate to customers and who lack the business acumen to be able to undertake analysis at the commencement of a project or integration at its conclusion. The review identified strong demand for graduates to be ICT professionals with generic professional skills (such as communication and teamwork) along with other non-technical skills (such as business analysis, sourcing and integration) in addition to the traditional domain skills (including programming and databases). Employers desired graduates with a broad range of ICT knowledge but with a depth of competency in at least one ICT technical area. A summary of the outcomes, including likely degree content, is provided.